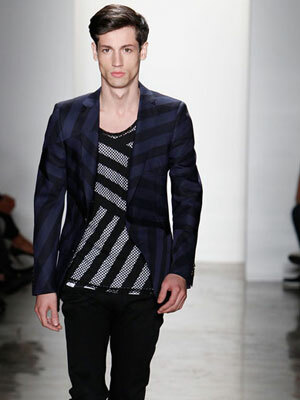 Although it may commonly seem like men are overlooked on the runway, there are countless reputable designers that are known for their remarkable take on the world of men’s fashion. Only a few months into the new year, there are tons of styles that have already been slated as the next in trend for fashionable threads. Here’s our look at unforgettable outerwear that’s guaranteed to keep you looking slick and in fashion whether you’re aiming for a casual day out or dressing to impress. 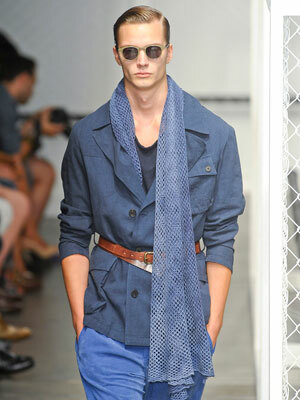 This blue blazer by Robert Geller, paired with a similarly blue hue scarf is a great example of how you can look sharp on a casual day. Note how this model has been styled and accessorized perfectly; contrasting sunglasses and belt, v-neck shirt underneath, and blue slacks help to keep with the overall flow of this almost 1980’s European-reminiscent style. The belt provides a more fitted style and defines the the shape of the waist, which can easily be lost when wearing outerwear such as jackets or coats. This look is overall very chic and great for these current Spring months where a light coat is essential due to slightly colder weather. If you’re aiming for a style that’s a bit more metro, you might want to consider something like this striped blue blazer from Simon Spurr. This is a great style for a night out at the club or a dinner date, because it’s tailored enough to provide a slightly more formal look while still having a fairly casual pattern. The matching striped contrast shirt is an interesting play on patterns and ideal if you want to wear something that’s more attention provoking to the eyes; however, you can easily wear a blazer like this with a solid colored tee or even a dress shirt. Dealing with business meetings and related meet ups can require that you also need to look your best throughout the day. This J Crew suit jacket is a perfect example of outerwear that is able to transition with you throughout the day, regardless of what types of social situations you may be in. For business meetings, you can pair it with darker hued slacks and a suitable shirt; later on when it’s time for a casual lunch or errands, pair it with some lighter colored slacks like the model seen to the left. This is a popular style that’s already springing up among fashionable business men in the city. 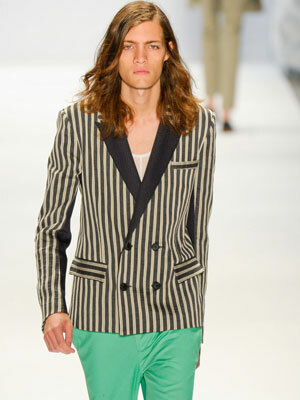 This striped blazer from designer Richard Chai is seriously exquisite. It hearkens back to the style of those old smoking jackets that you’ve probably seen worn by classic Hollywood film stars many decades ago. It’s classy, chic, and ideal for the man who is seeking to look more distinguished during his social endeavors. If you’ve been yoing around with the idea of adding colorblocking to your wardrobe, this style is certain to make a huge impression. Those who want to add a more subtle flair to the style can pair the blazer with a pair of simple black or navy blue slacks. For those days that are obviously more formal, you might want to consider picking up a three-piece suit, such as this pinstriped ensemble from Simon Spurr. This is the epitome of class and distinction, whether you are aiming to impress at a business meeting or any other professional endeavor. To keep with the in crowd, pair these three pieces with a popular contrasting color, such as the lilac shade that is being demonstrated by this runway model. The clean tailoring style seen here gives this three-piece suit a more modern edge. As you can see, the outerwear that you select and pair with ideal accessories can have a huge affect on the overall success of your ensemble. Whether you are using a few simple pieces or going entirely designer, having the correct type of outerwear is essential, because it’s the first level of garments that people tend to notice. It’s very easy to create a striking personal fashion statement if you know how to combine your outerwear and accessories correctly. In the next installment of our men’s fashion series, we’ll be exploring the importance of accessories in men’s fashion and take a look at some of the styles that are currently in demand.